Serial Report Chapter 72-William Forrest, Virginia Belmont, The Diamond Master. Tall and handsome with a distinguished military-like bearing, William Forrest was one of the top character actors of the ‘40s, ‘50s and ‘60s, appearing in well over 300 movies and TV episodes—including seven serials. Born October 10, 1902, in Cambridge, MA, the 6'3" Forrest attended Exeter Academy and graduated from Princeton in 1926 where he’d been the starting center for the Princeton football team and was on the crew team. Forrest came to L.A. in ‘38 looking for a career in show business. He started acting at the Pasadena Playhouse and was soon signed by a talent agency. 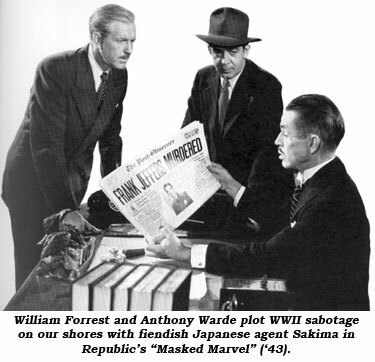 His first film was “The Amazing Mr. Williams” (‘39) w/Melvyn Douglas and Joan Blondell. From then on he was never out of work until his retirement in ‘77. 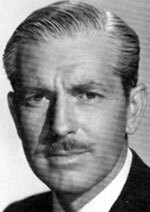 Best known as military officers, he played such roles in “Sergeant York”, “Keep ‘Em Flying”, “They Died with Their Boots On”, “Flight Lieutenant”, “Wake Island”, “Air Force”, “Action In the North Atlantic”, “So Proudly We Hail”, “Fighting Seabees”, “Marine Raiders”, “Follow the Sun” and so many more. One of his best remembered roles was as the tough, yet compassionate commander of Fort Apache on “Rin Tin Tin” (‘54-‘58). as Martin Crane, secretly in league with Japanese agent Mura Sakima (Johnny Arthur). It definitely was a bit odd for a heavy to be top billed, but our hero, Tom Steele, sadly received no billing. Friends and relatives remember Forrest as an adventurer. In addition to acting Forrest traveled around the world and once worked as a deck hand on a banana boat to Costa Rica. He and his wife Wilhelmina had two sons and a daughter. Forrest died at 86 January 26, 1989, in Santa Monica, CA. 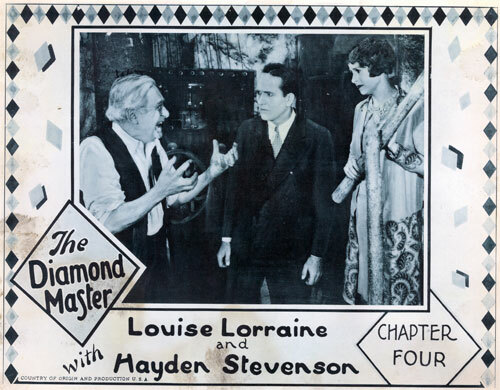 Criminals wish to steal the secret of how to make diamonds from dust in “The Diamond Master” (‘29 Universal 10 Ch. serial). This was a remake of Universal’s “Diamond Queen” (‘21). Shown here are inventor John Killner (Louis Stern), his daughter Doris (Louise Lorraine) and Mark Van Cortland Wayne (Hayden Stevenson). Walter Miller, the lead in Mascot’s “King of the Wild” (‘31), took as his second wife “actress” Eileen Schofield (1903-1980). 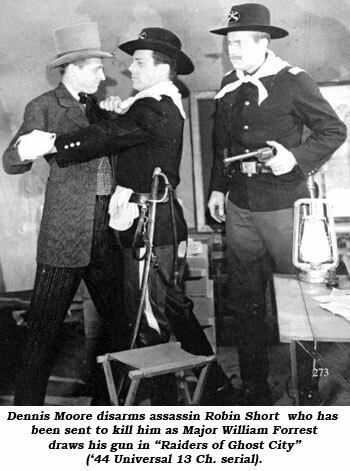 Schofield’s only credited role located was a small part in “King of the Wild”. 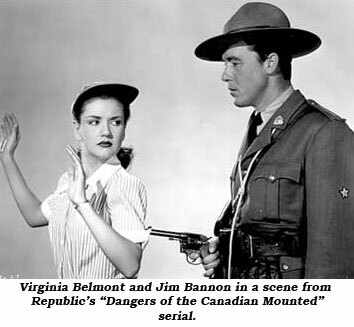 Vivacious 5'4" Virginia Belmont was born Virginia Schupp September 20, 1921, in Manhattan. She came west with her parents; her father was a mailman. Working at the famous Mocambo nightclub as a hatcheck and cigarette girl, Virginia was spotted by an agent who said she should be in pictures. After studying in little theatre and at Bliss-Hayden drama school, an RKO talent scout signed her to a seven year contract but she was dropped at her one-year option date. After a year (‘44-‘45) at RKO, Virginia was signed as a Goldwyn Girl and appeared in “Kid From Brooklyn” (‘46) and traveled throughout the U.S. as a Goldwyn Girl. In 1941 she married Albert Califano, a waiter at the Mocambo. In 1948 they left Hollywood and moved to Italy where Virginia worked in films and on stage. After returning to the U.S. in the mid ‘50s Virginia worked as a reservationist for United Airlines for 27 years. Her husband eventually opened Café Califano and later the Fontainebleau. Virginia died at 92, May 6, 2014, at her Hollywood, CA, apartment.